Chalk on the Wild Side encourages parents and their kids to play outdoors with a variety of chalk recipes and interactive games and activities. Playing with chalk has never been so fun--or so messy! Chalk on the Wild Side is the second title in Art Camp, an art series geared toward adults who want to engage in creative play with the children in their lives. 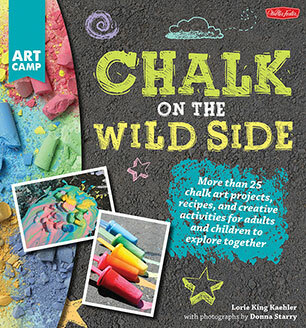 Designed to introduce young artists to a variety of art methods and techniques in fun, fresh, and inviting new ways, this addition to the series encourages parents and their kids to play outdoors with an assortment of chalk recipes and interactive games and activities. The first half of the book details a bevy of chalk recipes, from glow-in-the-dark chalk, fizzing chalk, and scented chalk to chalk foam, chalk goo paint, and ice chalk. Readers will then discover a variety of activities and ways to use their favorite chalk recipes. From classic games to 3D chalk projects such as chalk volcanoes, chalk powder bombs, chalk rockets, chalk hair dye, and more, parents and children alike will be delighted by the multitude of exciting ideas. Playing with chalk has never been so fun--or so messy! Chalk on the Wild Side offers parents an opportunity to allow their children the freedom to express themselves in colorful, new ways--with a medium that easily washes away clean. Before becoming a stay-at-home mom, Lori King Kaehler spent ten years working as a reading specialist. One of her goals as a teacher was to inspire a love of reading in her students. Her blog, Reading Confetti (www.readingconfetti.com), encourages parents to help nurture an appreciation for books in their own kids through book-themed crafts, science experiments, and learning games.